Exciting news for our members and embroidery lovers. Liz Almond from UK who is a designer and embroiderer known for her blackwork, whitework and counted thread techniques will be conducting masterclasses in February at our guild. 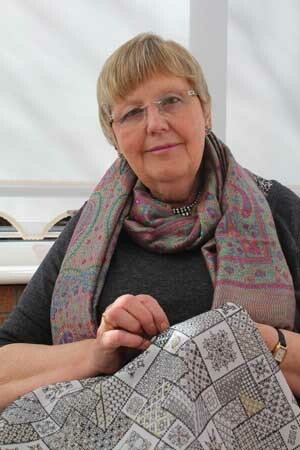 Liz, used to be a columnist for leading embroidery magazines like “The World of Cross Stitch”, “Just Cross Stitch”, “Cross Stitch and Embroidery” and “The Gift of Stitching”. She also ran an “agony aunt” column for needleworkers for some time. Liz has a website Blackwork journey on which she completed a series Saves the stitches designed to encourage people to share their love for embroidery.